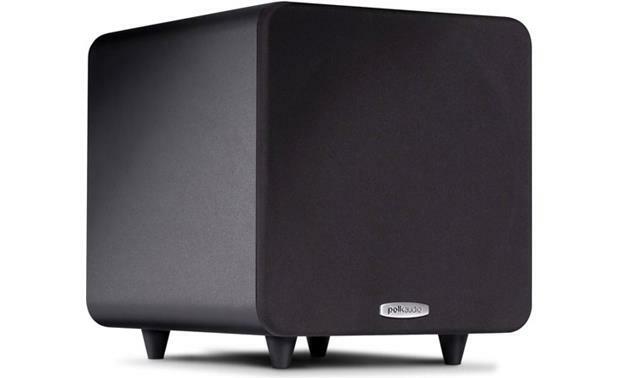 Add impact to your favorite movies and full-bodied bass to your favorite tunes with a sub that's barely larger than a cubic foot. The PSW111's high-current, 150-watt amp effortlessly drives an 8" woofer for dynamic low-frequency effects. 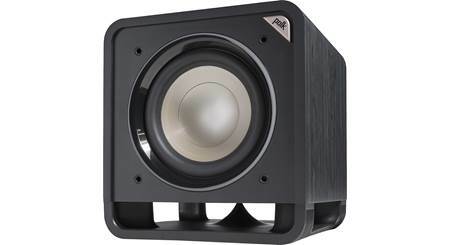 And this compact subwoofer sports a new, more powerful driver design to deliver deeper, louder, and punchier bass than previous Polk subs. Special circuitry inside the amp and a solid MDF cabinet with internal bracings ensure clean, detailed lows, even when you crank up the volume. "But the overwhelming sense I had from early listening was one of warmth. The low mid-range, the place where male voices, cellos, and trombones live, suddenly came alive. I could hear all this ambience I wasn't hearing before in movies and TV shows — street noises, intakes of breath, footsteps. Sure, you could take this sub to the slamming max if you want, but the main takeaway I have from adding this component into my system is that things have been put into balance again." Love this subwoofer! Clear and subtle bass more than supplements my overall soundscape. Can this be speaker be used in an outside patio application where it would be covered from the elements but exposed to humidity? It could but it is not made for those conditions. It would likely be fine for many years. As with most subs the box is made of MDF (compressed sawdust) that absorbs moisture readily! Driver: The Polk Audio PSW111 uses a 8" Dynamic Balance composite cone driver for deep, accurate response with low distortion. For a smoother response and improved durability, the woofer utilizes a rubber surround. Motor Structure: The PSW111 utilizes a powerful motor structure for a higher BL response (the measure of the motive force applied to the cone) that results in louder, deeper and punchier bass. 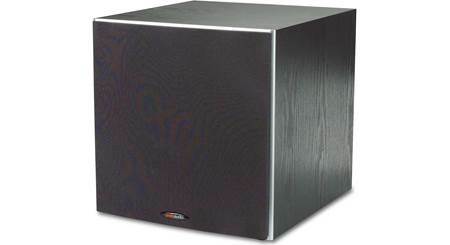 Amplifier: The subwoofer is powered by a high-current amplifier producing 150 watts RMS/300 watts dynamic power that supplies clean power for loud bass and the wide dynamic range necessary to recreate a life-like experience in your home. Enclosure: The PSW111 features a bass-reflex enclosure with non-resonant MDF construction and internal bracing for deep bass impact with superior detail and accuracy. Not Video Shielded: The subwoofer is not magnetically shielded, so it is not recommended to place it next to tube TVs and video monitors. Though LCD, DLP, and Plasma televisions are not affected by magnetism you should allow at least 18" of space between the subwoofer and any TV. Placement: You may place the subwoofer anywhere in your room, but it will perform best when it's on the same side of the room as your system's front speakers. 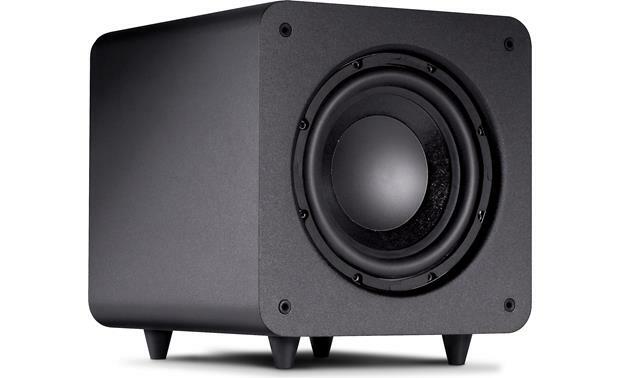 Also, placing the subwoofer near a wall or in a corner will reinforce the output. Volume Control: The PSW111 has a rotary volume control to adjust the volume of the subwoofer relative to the other speakers in the system. Low-Pass Filter: The PSW111 offers a continuously variable low-pass crossover, adjustable from 60-160 Hz. There is an LFE position for use with the filtered LFE output from a receiver or preamp. Line Inputs: The subwoofer has gold plated left and right RCA line level inputs for use with receivers having subwoofer or stereo preamp outputs that do not contain their own low-pass crossover. Using the Line Inputs allows PSW111 to do all the low-pass filtering. 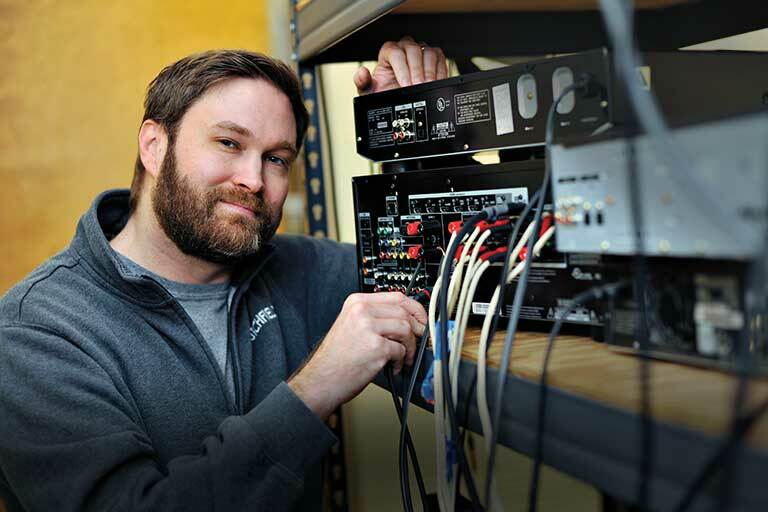 If your receiver or processor only has a single subwoofer line output, connect it to the Right line input jack. I have an older receiver with no subwoofer output. How does this hookup? You will need a crossover arrangement to attenuate the hi freqs. I am not sure it would work to just plug it into a speaker out. I am very happy with this speaker. My receiver does have a sub woofer out. This sub has speaker inputs and outputs meaning you hook the speakers directly into the sub then the receiver speaker jacks into the inputs on the sub. Is there a schematic diagram available for the electronics board (PCB) for the PWS111? I have no idea about a schematic for this woofer. I just used a RCA cable to my amp and turned it on. It sounds great. Can I get a wireless kit for this subwoofer? Michael, I purchased the iFinity wireless audio transmitter/receiver kit on Amazon. It works great. Yes you can. Just make sure to go into your televisions settings and recognize your external subwoofer. Does the variable crossover also control the speaker level out or is there a built in crossover for just speaker level outputs, like the def tech 800? 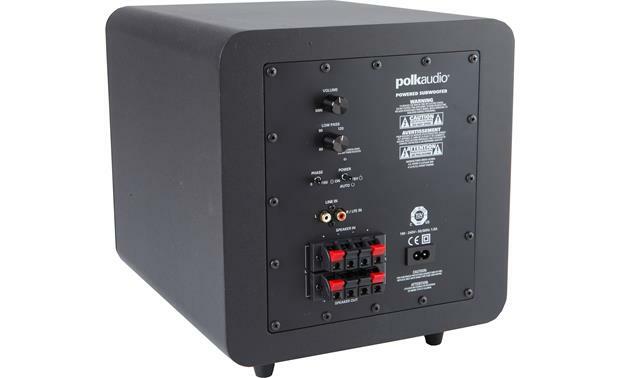 The details for the Polk Audio PSW111 sub show that the speaker-level outputs are not crossed over; and if you use that connection method, it's recommended to set you receiver's front speaker setting to "Large" (when applicable). If you would like to discuss further, feel free to contact an Advisor directly by phone (1-800-324-9695) or online chat. This is a great little sub, but I believe that it is strictly an indoor speaker. I would probably not risk it. Yes. I have these in my work van doors and they are exposed all of the time daily. Can this work for a bass guitar? No, This sub can't handle the volume and frequencies that a bas will put it out. You should get a guitar bass amp. I've got a inbox samsung system which sounds good buy lacking bass...I've got one speaker wire running to the sub can I split the speaker wire and run it into this sub and be safe and it work correctly? I forwarded your question to an Advisor and they responded with the following: I strongly recommend you follow the manufacturer's instructions, which will be found on page 8 of the owner's manual. 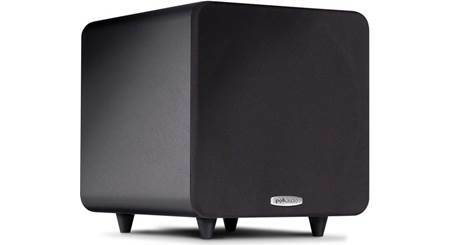 However, only ONE subwoofer should be used this way and that would be the Polk sub. The sub from your Samsung system will need to remain disconnected or you could have an impedance problem that would shut down your receiver/amp. If you would like to discuss further you can contact an Advisor directly by phone (1-800-324-9695) or online chat. I'm going to Egypt. Can this product handle 220/240 volts without any adapters? No it can not. The PSW111 has a 120V power supply. If you connected it directly to 220V it would fry the circuits. You would need to use a 220V to 120V step down transformer. Can I hook it up straight to the back of my tv? Thx! can I add couple speakers to this subwoofer in the back? I just did but I don't hear any thing out of it.. How it work ?? The amplifier in this subwoofer is only to power the sub. Other speakers will require another power source such as a receiver. For more info on setting up your system I'd recommend reaching out to an Advisor by phone or online chat. 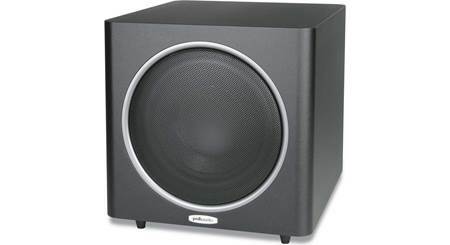 Searches related to the Polk Audio PSW111 Ultra-compact powered subwoofer.